As our practice deepens, we become increasingly sensitive to how our spiritual lives are deeply intertwined with our ethical behavior. This awareness of our inherent relationality is a source of tremendous inspiration but it can also bring challenge and disappointment. In this course, we bring together three teachings of the Buddha that support our being in relationship with others: mana (conceit), hiri (shame), otapa (guilt). Mana points to the dissatisfaction of social comparison, whether in the form of superiority (“better than them”), equality (“same as them”) or inferiority (“worse than them”). We will discern the difference between an experience of shame and guilt that is debilitating versus a discerned knowing that brings us into compassionate intimacy with others. This workshop will focus on how, in the teachings of the Buddha, a sense of personal identity is inseparable from ethical behavior. This course is intended for students who are interested in strengthening both their theoretical understanding of the topic and their direct experience through practice. It will include contemplation of the suttas, Dhamma talks, reflections, and group discussions. To become familiar with the various ways in which social comparison functions in our life; discern how the experience of hiri is distinct from a debilitating shame; discern how the experience of otapa is distinct from a debilitating guilt; increase a sense of personal integrity in one's ethical life. Venerable Pannavati Bhikkhuni is Co-founder and Spiritual Director of Heartwood Refuge in Hendersonville, NC, a multi-lineage retreat center and intentional spiritual community; and Co-Abbot of Embracing Simplicity Hermitage, a 21st century trans-lineage Buddhist Order. 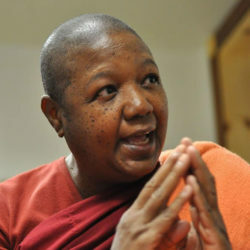 Ordained in Theravada and Mahayana traditions and a recipient of numerous international humanitarian awards she is both contemplative and engaged in compassionate action, world-wide. Pannavati currently serves the Global Buddhist Bhikkhuni Association, as a VP for the United States.